Hi, everyone! It’s Claire from The Kitchy Kitchen here. I’ve been thinking a lot about why I love s’mores so much. Is it the gooey, melty, crunchy texture? Maybe the surprising pop of bitter burnt sugar against the pillowy sweetness of the marshmallow? Or maybe it’s the ritual, the gathering around of a campfire, the ghost stories told along with the sticky fingers delicately pulling toasted marshmallows from a stick? It’s probably all of those things, but at the very least, I know that they’re a perfect summer dessert. The nostalgia hits me harder than the smoke in my eyes, and it’s like I’m a little kid again when I devour one. 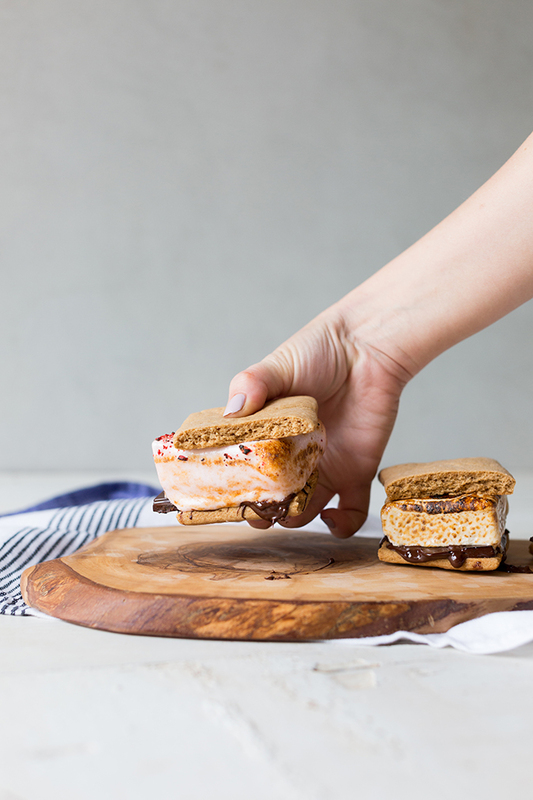 Honestly, you could rip open a bag of store-bought marshmallows and graham crackers and make perfectly delicious s’mores—I won’t stop you. But, BUT!, I will say that homemade marshmallows will completely elevate the whole experience. 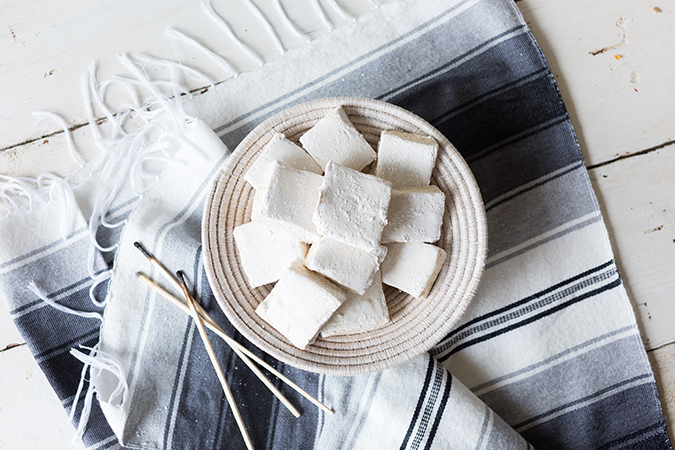 Even a plain homemade marshmallow has a cleaner flavor and softer texture than a store-bought one, making it even gooier and yielding. Fresh graham crackers have a fantastic bite and snap and can be custom cut for the perfect s’more size. 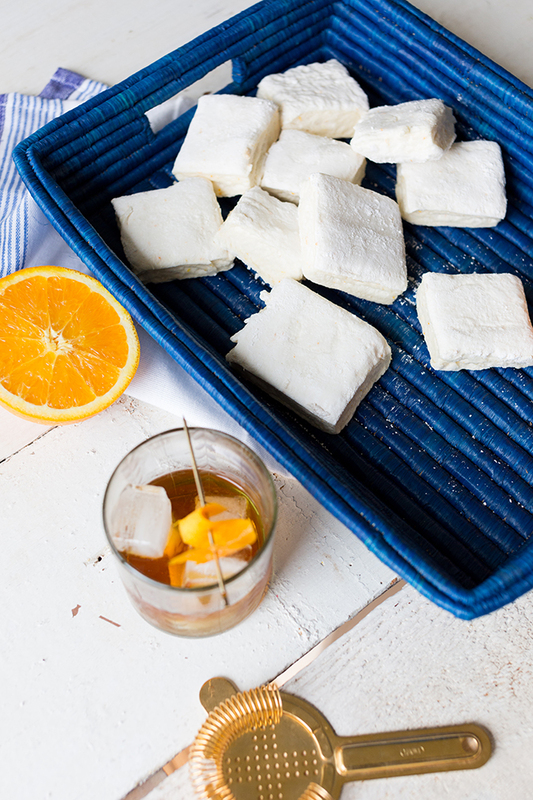 Plus, you can experiment with flavored marshmallows, and make something truly unique. 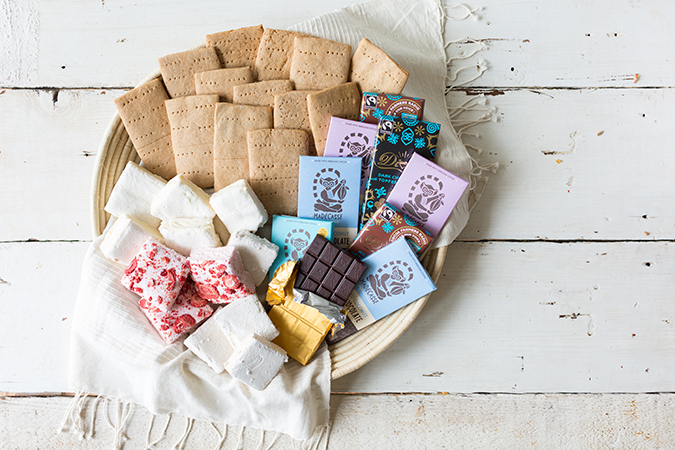 These are some of my favorite flavors below (all presented on beautiful woven trays, wood serving boards, and linens from Lauren’s fair trade shop The Little Market). Enjoy! 1. Oil bottom and sides of a 13 by 9-inch rectangular metal baking pan and heavily dust the bottom and sides with some powdered sugar. 2. In the bowl of a standing electric mixer, pour in a ½ cup hot water and sprinkle with the gelatin. Let it stand for about 10 minutes. 3. In a medium heavy saucepan combine the white sugar, corn syrup, and remaining hot water over medium heat, stirring with a wooden spoon, until sugar is dissolved. Bring the mixture to a boil and cook, without stirring, until a candy or digital thermometer registers 240 degrees, after about 12 minutes. Note: A word to the wise, this happens very, very While I turned around to tidy up, the entire batch jumped to 275 and burned, so once the thermometer reads 200, keep a close watch, and take it off the heat when it reaches 238. The thermometer should still creep up to 240 after that. 4. Remove the pan from heat and pour sugar mixture over gelatin mixture, stirring until gelatin is dissolved. 5. With the whisk attachment, beat the mixture on high speed until pale white, thick and nearly tripled in volume, about 6 minutes if using standing mixer. 6. In a large bowl, separately beat the egg whites until they just hold stiff peaks. Add the whites and “add ins” (for flavored recipes below) into the sugar mixture until it is just combined (about 2 minutes). 7. Pour the mixture into the prepared baking pan and garnish with the above ingredients (or sift a thin layer of powdered sugar) evenly over top. Let the marshmallow set uncovered, until firm, at least three hours, and up to 1 day. 8. Run a thin knife around edges of pan and invert pan onto large cutting board. 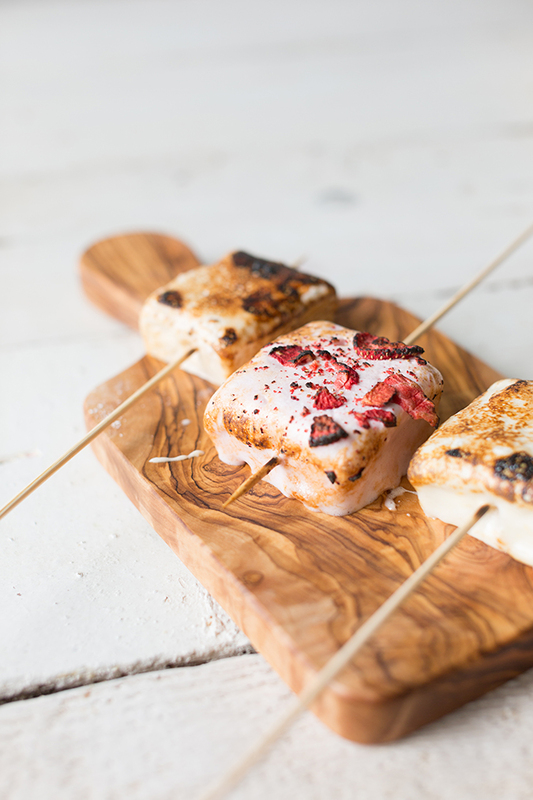 Lifting up 1 corner of inverted pan, with fingers loosen marshmallow and let drop onto cutting board. 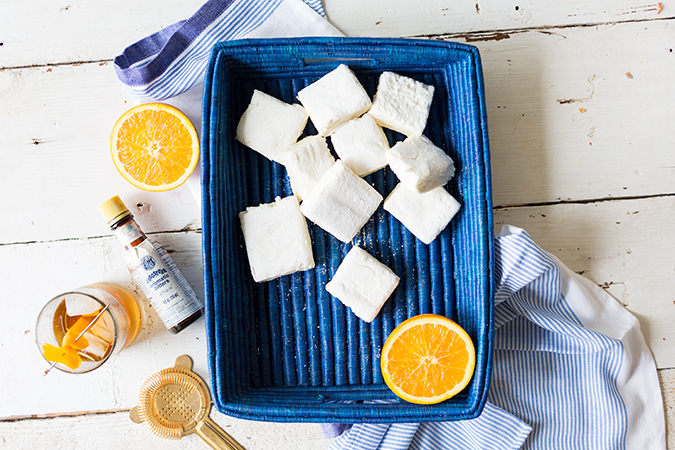 With a large knife trim edges of marshmallow and cut marshmallows into roughly 1-inch cubes. 9. Sift remaining powdered sugar into a large bowl and add marshmallows in batches, tossing to evenly coat. Marshmallows keep in an airtight container for up to 1 week. Add the combination of white and brown sugar to the syrup ingredients as you begin to heat them up. Add the liquid smoke during the final mix of the marshmallows. Add the orange zest and whiskey to the syrup ingredients as you begin to heat them up. Add the bitters during the final mix of the marshmallows. Add the strawberry puree and lemon juice to the syrup ingredients as you begin to heat them up. Strain to add to the gelatin before mixing. 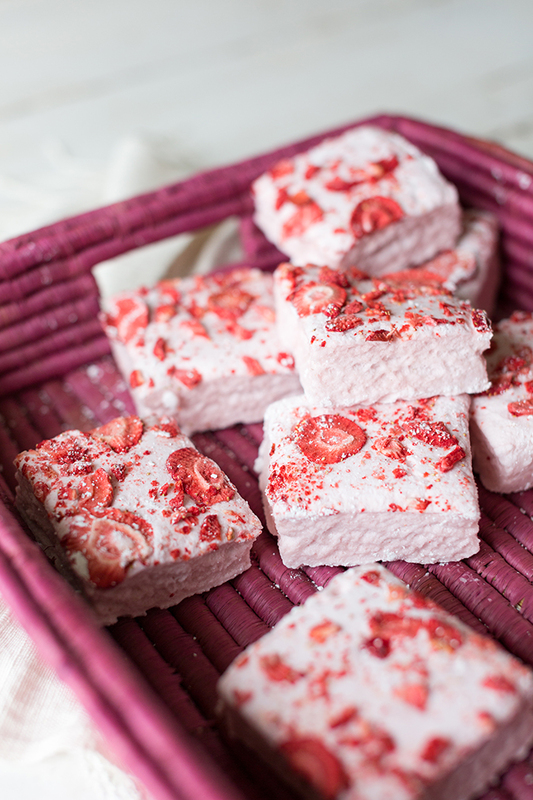 Once marshmallows are poured into the pan, sprinkle with freeze-dried strawberries on top. 1. Sift together the whole wheat flour, all-purpose flour, baking powder and baking soda; set aside. 2. In a medium bowl, cream together the butter, brown sugar and honey until light and fluffy. Stir in the sifted ingredients and end with vanilla. Cover dough and refrigerate overnight. 3. Preheat the oven to 350 degrees Fahrenheit. Roll out the dough to about 1/8-inch thick, and slice into 5 x 3-inch rectangles. I like to score my graham cracker dough in quarters, like the ones you’d see in a box, but you can do whatever pattern or shape you like. Place rectangles onto ungreased cookie sheets. Mark a line down the center of each one, and prick with a fork. 4. Bake for 13 to 15 minutes in the preheated oven. 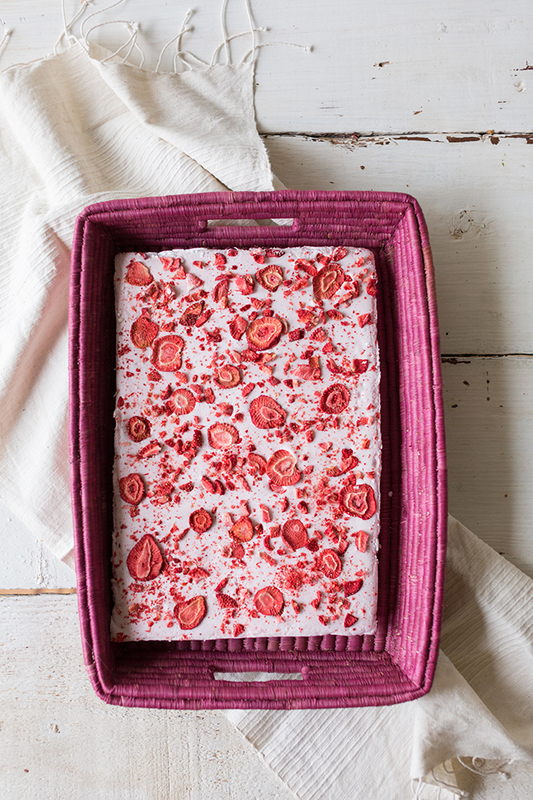 Remove from baking sheets to cool on wire racks. And there you have it… All you need is some fair trade chocolate from The Little Market, and you have the most delicious s’mores ingredients ever. 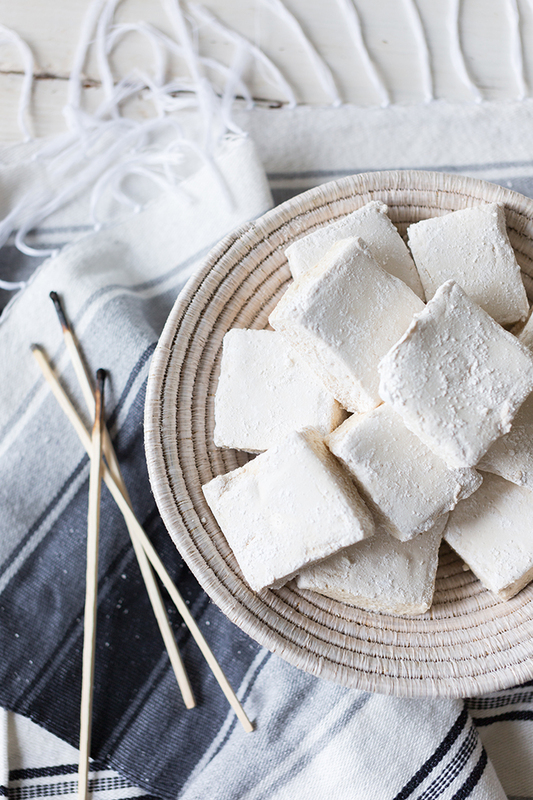 Have you ever made homemade marshmallows before? I think you’ll find it’s well worth the effort!